TreeVersity explores change in trees over time. Users can use TreVersity to analize relative and absolute change over one variable in each node, as well as created and removed nodes. Moreover, analysts can use TreeVersity to compare non-inherently hierarchichal datasets, by grouping them by it's attributes. For example, users looking at the change on the number of movies watch, can build a hierarchy grouping by age ranges, then by gender and then by favorite music genre, and answer questions like "how has changed the number of terror movies watched by teenage girls in the last year?". 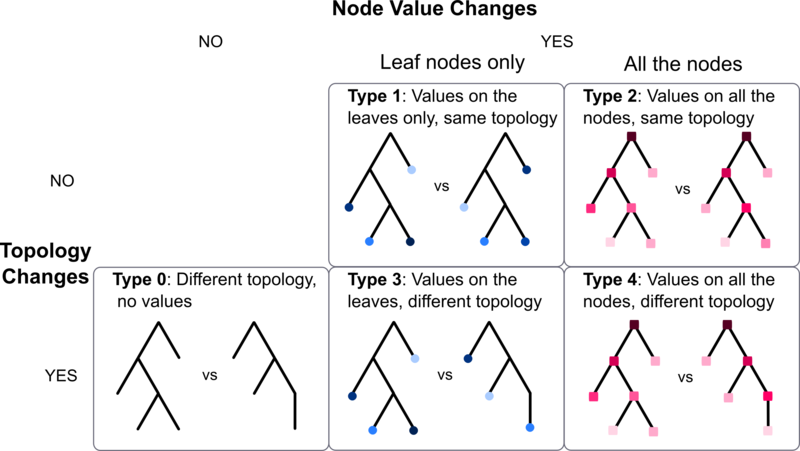 Type 0: Topological differences between two trees where the nodes only contain a label. Example: Finding created, moved and removed topics between two versions of the TRB research publications hierarchical categorization system, without looking for number of papers. Type 1: Positive and negative changes in leaf node values with aggregated values in the interior nodes (i.e. trees that can be visualized with a treemap) and no changes in topology. Example: Comparing the change on the number of workers on the traffic agencies of the country, grouped by Agencies, Counties and Regions, given that no Agencies are created or removed. Type 2: Positive and negative changes in leaves and interior node values with no changes in topology. Example: Comparing the salaries in the Department of Transportation’s organizational chart between two years, when no reorganization has occurred. Type 3: Positive and negative changes in leaf node values with aggregated values in the interior nodes and with changes in topology. Example: Again finding changes in the TRB research publications hierarchical categorization system, but looking at changes in the number of papers published by topic and at created, removed nodes. Type 4: Positive and negative changes in leaves and interior node values, with changes in topology. Example: Comparing the number of TRB’s website visits between two months using the file hierarchy as a natural organization. Some pages might be created or removed, and each page in the hierarchy has an independent number of visits. Most of the previous work on the field has focused on Types 0, and Types 1 (for a more comprehensive listing please refer to our technical report), TreeVersity was designed to support tree comparison types 1 to 4. Django for the application server, and therefore Python as a programming language on the server.